This beautiful village is tucked away on the side of a mountain. The drive up to the city made me a little nauseous because of all the twists and turns along the way, but I must say... it was MORE than worth it. 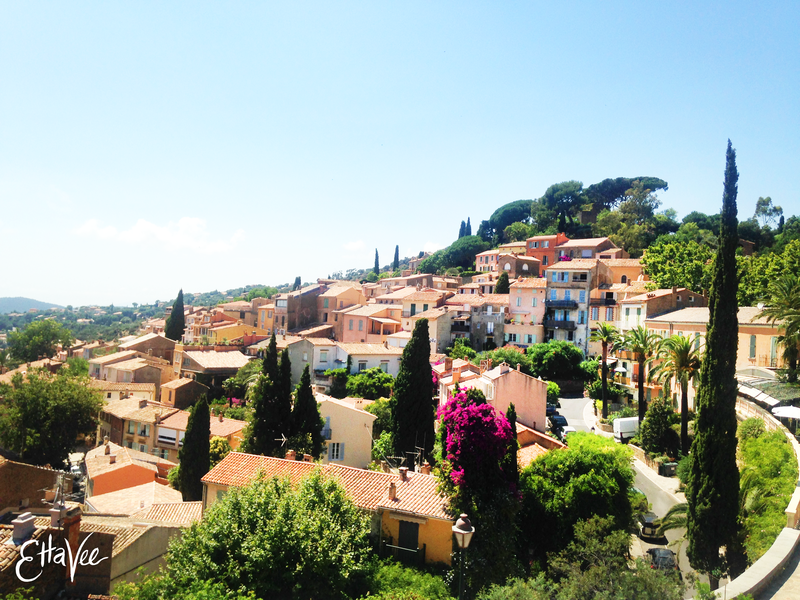 Bormes-les-mimosas gets it's name from the mimosa flower which blankets the city around the beginning of the year. Even though the flowers weren't in bloom, the village charmed its way into my heart! The city is full of cobblestone and small passageways! flowers bloom EVERYWHERE, which also means there were all kinds of insects pollinating away (and biting the crap out of all of us). But goodness just look at this gorgeousness! After exploring the city we drove down to a small hidden away beach for a quick cool-off swim. It was so beautiful and the perfect way to finish the day! If you ever find yourself in the south of france, I highly recommend visiting Bourmes-les-mimosas. It was hands down the most charming village i've ever visited! Thought I'd throw in a reflexive verb today. I'll be spending this week in the south of france with Pierre's family, where I'll be doing a whole lot of relaxing.